The proposed goods and services tax (GST) regime promised the nation to inter-alia fix the issues above and ensure the reform aims at simplifying the indirect tax levy. In the latest round of its meeting, while the GST Council did finalise the tax slabs though without basketing goods and services in these slabs, no solution for cross-empowerment had majority takers. India has perennially marked the presence of one of the most complicated indirect tax regime followed across the globe for reasons well known to all quadrants. These ranged from divided powers between centre and states to levy different taxes, distinction between goods and services, multiple tax rates & arbitrage on rates across the country as well as multiplicity of assessments. The proposed goods and services tax (GST) regime promised the nation to inter-alia fix the issues above and ensure the reform aims at simplifying the indirect tax levy. The ball was set rolling with changes to the Constitution followed by setting up of the GST Council to address key issues on GST. The council in its meetings thus far has progressed on several key issues and was reconvened on November 3-4, 2016 with top agenda to finalise tax rates, address states’ compensation row and sort guidelines on cross-empowerment of centre and state tax authorities. This was imperative from a timing standpoint given the aspirational start date of April 1, 2017 for GST. In the latest round of its meeting, while the GST Council did finalise the tax slabs though without basketing goods and services in these slabs, no solution for cross-empowerment had majority takers. The rate structure consented to include slabs pegged at 0-5-12-18-28 per cent respectively. Further, an identified list of goods commonly characterised as demerit or sin goods, would attract an additional cess (above the 28 per cent rate), the proceeds of which would be used to make up for financial losses that states suffer owing to a shift to the GST regime. * The 5 per cent slab was agreed, against the proposed slab of 6 per cent, to reduce the common man’s burden. * Several goods, including white goods, that currently suffer a tax rate of 30-31 per cent would not be automatically tagged to the 28 per cent slab and that, several such items which are commonly used by the “lower middle class” also could be expected at 18 per cent. * The 28 per cent slab though higher than proposed slab of 26 per cent was still lower than the current effective tax bill the relevant goods foot and in any case many of these are now moving to 18 per cent as seen above. The biggest surprise has come for the products likely to be under the 28 per cent category, e.g. white goods. These industries were looking forward to a rationalised rate of 18 per cent and passing on the benefit to consumers at large. Albeit, that isn’t meant to be. No announcement was specifically directed at GST rate on services but the informal understanding is that the same would be covered under 18 per cent. FM mentioned that the tax rate on gold was not finalised and could be anywhere between 2-4 per cent depending upon how related factors pan out. On an overall note, multiple tax rates is a significant departure of how an ideal GST structure with maximum of two rates could have been. With this backdrop, all eyes are on the list of the goods that would fall under the respective rate categories. Needless to mention, the categorisation of what qualifies as “mass consumption” products, products for “lower middle class” would indeed involve some level of subjectivity and it is unlikely the outcome would indeed be a perfect one. Also, industry is hoping that the lists are unambiguous in terms of products which fall under the respective categories. It is hoped that a clear HSN based classification is done — else, classification disputes will continue under GST as well. On cess, the modalities remained unclear. The FM did mention that the cess would work as an additional GST (thus impliedly altering the rate) rather than adding another line item on the invoice. 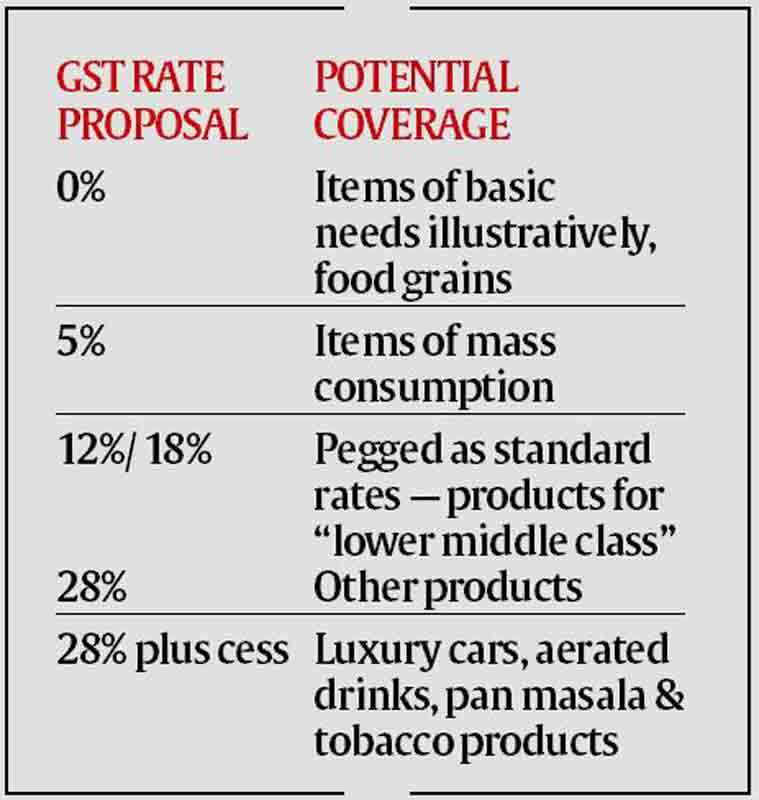 The quantum of cess would vary from product to product so as to achieve a GST rate for said goods as is equal to effective current rate of tax. The cess would be reviewed annually and last 5 years from implementation of GST in India. While burdensome, but the approach seems to give financial cushion to the central government for compensating states under a righteous approach of not tagging all demerit or sin goods at a common rate and thus making some expectedly more expensive. On the issue of dual control, barring the earlier consensus that states would administer taxpayers up to a limit of Rs 1.50 crore no further headways have been made. The FM in a post meet media address said that consensus was far from being reached in hunt for the approach that best serves the taxpayer’s interest. Sources, however, suggest that the issue is not being concluded due to a disconnect between centre and states on the powers to administer and assess taxpayers. Apparently, the states want powers to assess possible top taxpayers including service providers (a fractured vertical division of powers) though lacking relevant experience and while the centre wants a horizontal division, which would possibly keep states away from top taxpayers. The council now re-convenes on November 24-25, 2016. Earlier it was a widespread expectation that all key aspects including the control/ jurisdiction issue will be resolved by the recently concluded round of council meeting so that he draft GST legislation could be completely finalised before the winter session of parliament commencing November 16, 2016 and could be tabled therein for approval. Given the pass now, the imperative question is whether the April 1, 2017 date is still in the run — it seems so!